Some dishes just aren’t work the effort. And in hindsight I was very foolish with this dish. 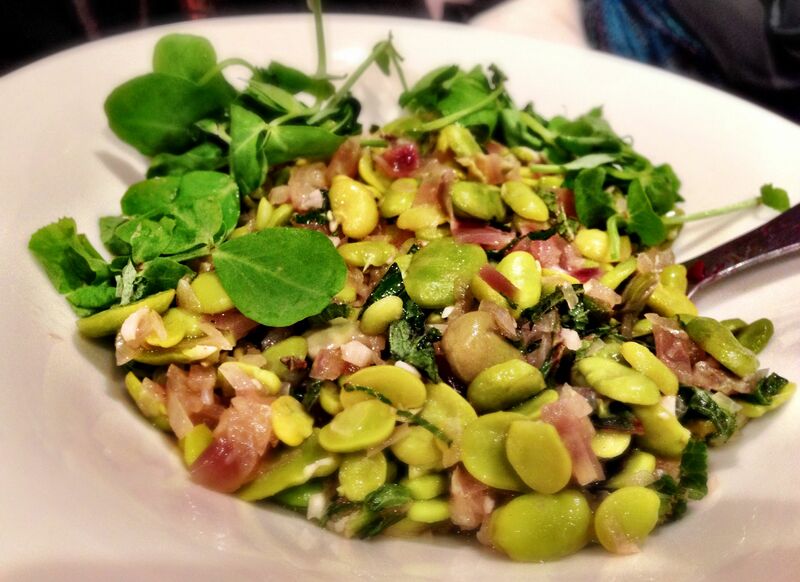 I’ve been looking forward to cooking with Fresh Broad Beans for months. I was naive to assume that you could buy them podded. I was even more naive to assume that podding was quick. Top of the naivety pile was that podding wasn’t the end of it – you have to peel them as well. It took Freya and myself almost 2 hours to pod and peel two bags of Broad Beans. 1.5 kilograms of broad beans ended up as less than 350g of podded and peeled broad beans. In that time we watched Kill Bill Volume 2. It took that long. Suffice to say that by the end of it all there was very little enthusiasm to eat. It was just too late – and I felt I knew each broad bean too personally to then cook and eat them! Anyway back to the recipe: don’t bother – go hungry and save yourself two hours. You’ll lose weight too and your fingers won’t be sore! But seriously: once you’ve podded the peas, add them to some softened garlic, red onion, sugar and sea salt. Add some stock and cook for 20 minutes – until all the liquid is absorbed. Stir in some dill and lemon juice and serve. This recipe looks so quick and simple when you are flicking through a cookbook – but getting stung with pea podding and peeling (how many times have I whinged about this now?) means it’ll take you a good couple of hours (and that’s if you have a willing partner who will suffer with you while you pod). I’ll try this recipe again with frozen and defrosted broad beans. It will probably be fine. But this isn’t a recipe that sets my world on fire. It just didn’t have the excitement and the flavour I was expecting. Sorry Maria, this is one recipe from ‘The Modern Vegetarian’ that I just didn’t enjoy making. Just when I thought Ottolenghi was infallible – I made this. On paper it was going to be great. 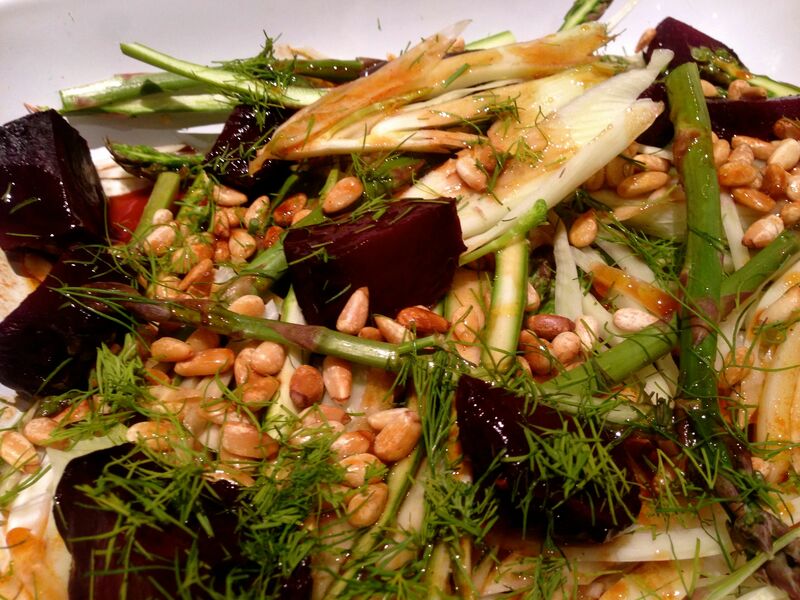 Three of my favourite ingredients are beetroot, asparagus and fennel – and they are all in this dish. And they all require no cooking (unless you’ve roasted some raw beetroot). Actually – it’s worth making the comparison here between the shop bought stuff that has been prepacked – and buying raw beetroots and roasting them. The stuff in the packet just doesn’t have the flavour and generally has a very high water content – it’s a poor imitation of the real thing. Often books ask you to boil them in water – or roast them wrapped in foil. I do neither. I simply top and tail them – put them in a Halogen oven and roast them – with no oil – just as they are – until they are tender – which generally takes 40 minutes. Let them cool – peel them – and they will be so tasty and not at all wet. Anyway – back to the recipe. There are only two other ingredients to this recipe. Pinenuts – which you toast at the end – and Verjus. I first saw Verjus when I watched Australian Masterchef. The Australian format of Masterchef is far superior to the UK version – far more engaging – and you really get to know the competitors and the hosts/chefs. Anyway – on the show they visited the farm of Maggie Beer. She used verjus in one of her recipes and sung its praises so I was curious to get some. Verjus is a highly acidic juice made by pressing unripe grapes, crab-apples or other sour fruit (says WIKIpedia). This is quite an understatement – it’s MEGA acidic and sour. I tasted it before I carried on with the recipe! The recipe wants you to reduce 320ml of this very sour juice down to 3 tablespoons – 45ml. So make it even more sour and acidic. I have to say the result was intense. I’m quite well known at work for liking really sour sweets – and really salty liquorice. I’ve yet to be defeated on the sour sweets – but I reckon the reduction of this verjus could be used to create a monster! It was probably the most sour thing I’ve tasted. Maybe there are different sournesses (is that a word) of Verjus – I hope so – otherwise I’ll never use this ingredient again. The dish is essentially all the prepped vegetables with the Verjus dribbled on top – and then dressed with the pinenuts and some dill. Neither of us liked it – it was too sour. It was like having all the moisture sucked out of your face. Not good. Such a shame because the Fennel and the Asparagus were very good before the dressing (chef’s snacks!). Oh well – you can’t win them all. This is an odd one for breakfast, taken from Honestly Healthy for Life. Chia seeds are tasteless seeds – and all you do is soak then in milk – we used Almond Milk and Hazelnut Milk – and a half teaspoon of cinnamon. This has a completely different texture to an oat based porridge, but you do have to soak the seeds for some time. It says 30 minutes in the recipe – but I’d say a couple of hours might be better. That’s what we did. The texture is a bit frog-spawny. Freya didn’t like it. I thought it wasn’t too bad. The compote went really well with the porridge. There was also a sprinkling of almonds. The compote is made up of raspberries, blackberries, agave syrup, vanilla extract and kuzu. The ingredients are boiled up and simmered and that’s pretty much all you have to do. Kuzu is one of my ‘special’ ingredients. It’s a gluten free starch made from the kuzu root, which is used for thickening. 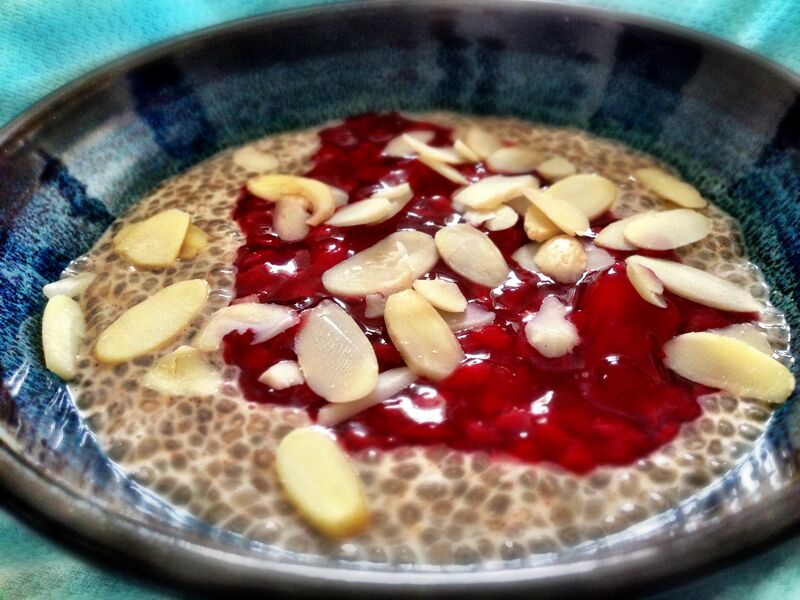 Unless we can’t find another use for the Chia Seeds we have I imagine we won’t be making this again. Although it is supposed to be really good for you, it’s relatively tasteless. This is weird. In fairness when we saw it in the book we said – that looks weird, we should try it. If you think about it too long, you won’t try it. 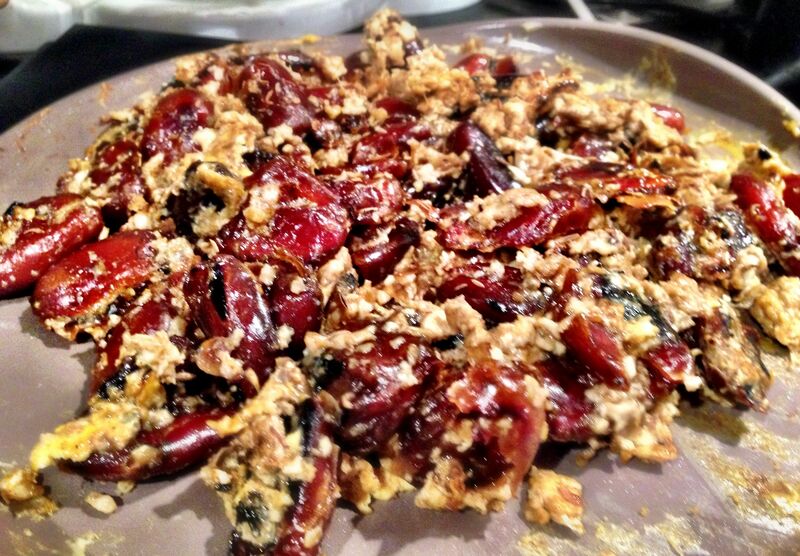 Because it’s dates and fried egg mixed together. That’s it nothing else. I feel kind of sucked in by the narrative under the ‘Western International Breakfast’ where the author says ‘Because the best food in the world is often the simplest’. This may be true – but only of other dishes – not this one! Freya didn’t like this – as was apparent when we swapped plates once I’d eaten three quarters of mine and she’d merely moved her food around the plate. Obviously I have concerns for how regular I might become having consumed 250g of dates – but I’m sure I’ll be fine! I only made this while I waited for the Ocado man to deliver our groceries. Freya was hungry and in need of a quick nibble. I should have waited 15 minutes – although I guess I’d have made it eventually. Have I got across to you all that I won’t make this again? Good! This seemed good until I read the recipe a bit closer and I was dubious that it would work. After boiling some leeks until they are soft and patting them dry, you dip them in egg and breadcrumbs and fry. You also make a pickled red pepper topping – and a yoghurt, sour cream sauce. 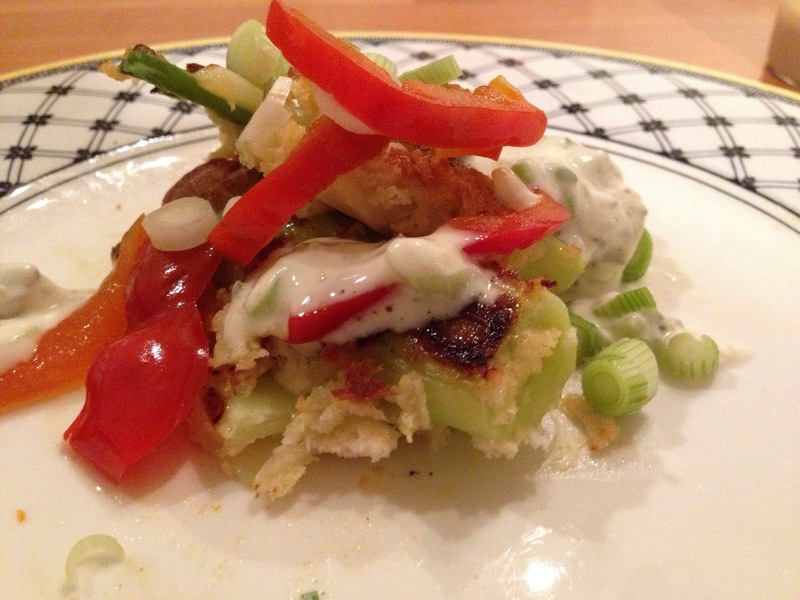 You then plate the fried leeks with some sauce and peppers – and a few chopped spring onions. Unfortunately leeks aren’t good carriers of egg – and in the end the breadcrumbs and eggs just ended up being separate entities in the pan. It still tasted good – very good in fact – it just didn’t look great. I don’t think I’d make them again just because I like my food to look good. I still haven’t made an Ottolenghi dish I haven’t enjoyed – I just didn’t like the presentation of this one – but that’s probably just my fault. This dish took ever so slightly longer than most. I actually had to cook something this time! 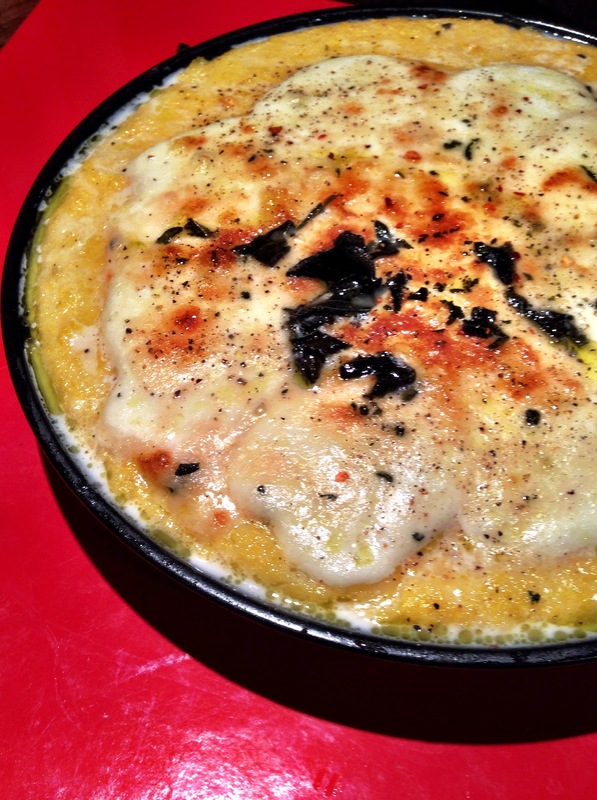 Cook up some polenta and when it’s done pop it into a round pizza type dish about 2cm deep. I think mine is less as I used a bigger dish. Let the polenta cool down so it solidifies – you want it to resemble a pizza dough somewhat. I left mine outside as a frost was on the way. Fortunately the local wildlife didn’t get at it! Then simply top with Mozzarella and Parmesan, olive oil, dried chilli flakes and fresh sage (that you have dried – not dried sage) and bake in an oven until it’s bubbling. I dehydrated my sage in an halogen oven – to book suggests leaving it on a window sill for a few days – but who has time for that during the working week! I got sucked into the vortex that is talking to my in-laws whilst making this and by the time it was ready it was too late to eat it – so it’ll have to do for lunch tomorrow. Hence the uncut pizza picture. There’s no reason for it not to be yummy with the amount of cheese in it. Just be careful not to over salt the polenta as the parmesan is pretty salty already. We had this for lunch and it’s just too heavy. I think if you could halve the Polenta and put a bit more flavour in it than just salt then it might work – but for now I’m going to give this a miss.